Del. Chris Peace (left) and Margaret Nost were guest speakers at recent New Kent Rotary Club meetings. 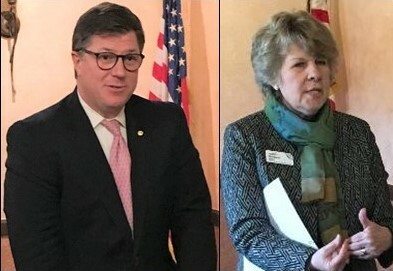 Peace spoke to the organization about the House of Delegate’s plans to improve education and the health care system in Virginia, while Nost addressed the club about Community Foundation of Greater Richmond’s outreach program.